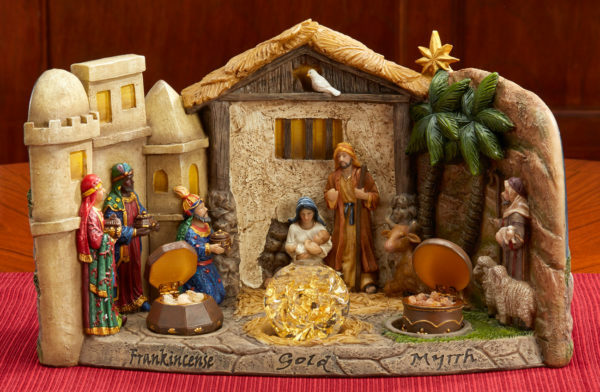 The front side of this beautifully crafted semi-circular Nativity depicts the Kings and Shepherds arriving at the stable to meet the baby Jesus. The scene shows the stable in the center, Bethlehem on the left and the plains of Bethlehem on the right. In the center, Mary sits near the manger holding the Christ child. The foreground is adorned with real gold (23k gold floating in a hand-blown glass globe) and chest filled with authentic frankincense and myrrh. The panoramic back side of the Nativity shows a beautiful scene of the shepherds in the field learning the Good News that “For unto to you this day is born a Savior”. 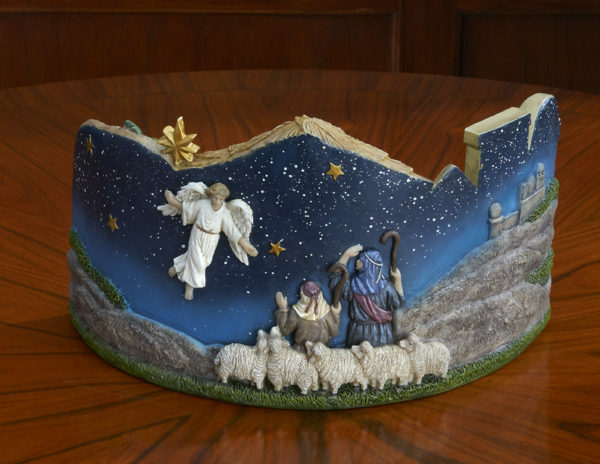 The set is made of intricately hand-painted resin and measures 12 inches wide by 7 ¼ inches tall and 7 inches deep.